Banff & Buchan MSP Stewart Stevenson has welcomed an announcement from the Scottish Government that small and medium sized businesses in the manufacturing, textiles, food & drink and energy sectors will be offered £2,000 to take on a new apprentice. The financial incentive will help young people gain new training while taking part in apprenticeships and help the companies involved to grow. “Supporting apprenticeships is an important part of Scotland’s economic recovery efforts and I welcome this latest action from the Scottish Government. Helping young people to gain new skills through apprenticeships is a key part of expanding Scotland’s skilled workforce. “This scheme will help to create opportunities for Scotland’s young people who are at the start of their careers but will also grow our skilled workforce and make Scotland a more attractive place for companies to invest. “I hope that eligible businesses in Banff & Buchan will seriously consider taking part in this scheme, gaining support to grow their business and helping 16-19 year olds to learn invaluable new skills”. Banff and Buchan MSP Stewart Stevenson has welcomed the publication of a book by leading economists Ronald MacDonald and Paul Hallwood which calls for the Scottish Government to be given cotrol over taxation. "This is an extremely welcome publication from experts in the field recommending fiscal autonomy for Scotland. The UK Government’s cuts make it essential that Scotland is responsible for all tax and spending, including North Sea revenues. "The latest GERS report shows Scotland with a current budget surplus of £219 million, or 0.2 per cent of GDP – compared with a UK deficit of £5.3 billion, or 0.4 per cent of GDP. "Scotland stands on a firm financial footing – stronger than the UK as a whole – and full fiscal autonomy and independence are the key to a flourishing and economically successful Scotland." Banff & Buchan MSP Stewart Stevenson has received an assurance from Aberdeenshire Council that the climbing wall at Peterhead Community Centre will re-open during November. All six of the council’s climbing walls – including Peterhead – were closed in July following an annual safety inspection. Mr Stevenson was contacted by several regular users of the climbing wall who complained that they were being left in the dark s to what was happening and had been given no indication of when matters might be resolved. Mr Stevenson took the matter up with Aberdeenshire Council and has now been advised that Peterhead will be treated as a priority for re-opening due to the numbers of people who use the facility, and that re-opening will take place during November once final remedial works are completed. “The climbing wall is clearly a very popular facility judging by my mailbag on this issue. “Clearly, safety must come first and if a safety issue is identified then the council has a duty to protect the people who use the facility. However, it does appear that there has been a lack of information available to the users letting them know how long the wall was to be out of action and, indeed, what the problem actually was. Scotland must share in the economic and environmental benefits of a high speed rail link across the UK, a report submitted to the company responsible for examining the proposed link outlines today. The formal submission of the Scottish Strategic Business Case to High Speed Rail 2 (HS2) today outlines the preference for a line that splits north of the border with links to both Edinburgh and Glasgow and backs the Scottish Government’s commitment to ensure Scotland shares the benefits of a high speed link to the rest of the UK and mainland Europe. Transport Minister Stewart Stevenson outlined the Scottish Strategic Business Case, prepared by Transport Scotland on behalf of a Scottish stakeholder group created to input into the UK planning process. Mr Stevenson said: “This Government is committed to ensuring Scotland’s voice is heard – the economic and environmental case for high speed rail is clear, compelling and crucial. “It is essential we plan for the future with a clear, long-term vision for high speed rail. With a predicted increase in passenger demand across all routes, this Strategic Business Case shows that extending a link to Scotland will maximise the overall economic and environmental benefits of any high speed rail project. “Only a full line will deliver the change required to achieve modal shift from air to rail. Journey times of less than three hours would make rail a more attractive travel choice, leading to a reduction in carbon emissions and contributing to achieving climate change targets. While the first phase of the High Speed Rail project will consider the case for services between London and the Midlands, UK Government transport minister Lord Adonis has asked HS2 to examine the potential for expanding high speed services into Scotland and the north of England. HS2 will report its initial recommendations for the service between London and Birmingham by the end of 2009. This initial report will attempt to clarify issues such as costs, proposed routes and technologies which would be required to turn the proposals into reality. An initial review by Transport Scotland has revealed that new improved train timetables across East Scotland have been a hit with passengers, with many services seeing a substantial increase in users - some by almost 30%. Launched in December 2008, the new timetables are operated by ScotRail and cover the east of Scotland, from Edinburgh, through Fife and Dundee to Aberdeen and the North East. The timetables were redesigned to improve journey times and connections on key routes serving the major cities, as well as to enhance links for local stations. This has included additional early morning and evening peak services for commuters, extra trains between cities and services timed to provide better connections for onward train and bus journeys. The most popular revision is additional commuter services on the Inverurie to Aberdeen route which, coupled with improved facilities at Inverurie Station, has generated a boost of 29% in passengers. New hourly services between Edinburgh and Perth have also been well received with a 26% increase in users, and the new twice hourly service between Edinburgh and Dundee has also been successful with a 4% uplift in passenger numbers. Additional rail services at Leuchars have also increased passengers by 10% and 2% on the Leuchars to Dundee / Edinburgh services respectively. In addition to the passenger growth to and from Leuchars station itself, more passengers are using the station to travel on to St Andrews where the installation of ticketing and new passenger information systems at St Andrews is providing passengers with better planning, connections and booking facilities. The report compares passenger journey figures between January and September 2009 to the same period the year before. Scottish Transport Minister Stewart Stevenson said: “The new timetables are one of a number of rail initiatives to support our aim of connecting communities and making Scotland more accessible. Steve Montgomery, ScotRail’s managing director, said: “These are impressive figures, delivered against a background of more services and seats, and improved punctuality and reliability figures. Transport Minister Stewart Stevenson today announced a multimillion pound boost for road users of the A96 with the appointment of a contractor for the Fochabers to Mosstodloch scheme. Transport Scotland will be awarding the £31.5 million contract to Morrison Construction to build a new 5km stretch of all-purpose single carriageway on the main road between Aberdeen and Inverness. This project, combined with a raft of other work on the A96, reinforces the Scottish Government's commitment to the route. "The award of the A96 Fochabers to Mosstodloch contract is yet another example of our continuing investment in Scotland's transport infrastructure and is helping the hard pressed construction sector through challenging economic times. "The A96 is an essential route in Scotland's trunk road network and this stretch of new road will improve links for communities locally and between Inverness and Aberdeen, bringing economic benefits across the north. "I'm delighted to announce the contract award which will soon be moving to construction. Our commitment to improved links across Scotland is clear and the undoubted benefits to be reaped will be felt across the north by communities and businesses alike." 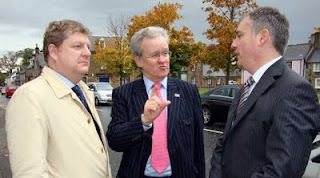 "The Scottish Government is determined to improve links along the length of the A96. We are currently working with Highland Council reviewing proposals for dualling the A96 Inverness to Nairn, a Nairn bypass, and a bypass on the east of Inverness linking the A9 to the A96. Work is also progressing well with Moray Council to review ways of addressing congestion in and around Elgin. "We are determined to deliver improvements on the A96 and are working tirelessly to provide improved links on this vital artery." pedestrian and cycle links will be improved with a number of underpasses constructed within the scheme to provide safe crossing points for school pupils travelling from Mosstodloch to the primary and high schools in Fochabers. the installation of CCTV cameras near Inchberry Road will be linked to the local police control room. "We have a proven track record of successfully delivering key road improvement schemes across Scotland and this award is a tremendous boost for the company and its employees. "As a major North of Scotland employer we are particularly pleased to have this opportunity to build on our long association with the Moray area and play a key role, working with our project partners and Transport Scotland, to design and construct this important infrastructure project. "We will now begin the detail design in readiness for the start of construction work on this eagerly-awaited scheme." Works on the A96 Fochabers-Mosstodloch scheme are expected to begin later this year. Stewart Stevenson demonstrates Scotland's leadership on climate change at EU talks in Luxembourg. Scotland's Climate Change minister Stewart Stevenson joined other European environment ministers in Luxembourg today for crucial talks ahead of the United Nations climate change summit in Copenhagen in December. Mr Stevenson is part of the UK delegation to the European Environment Council, which also includes Ed Miliband, Secretary of State for Energy and Climate Change. The Council is looking to agree the position the EU will take at the negotiations in Copenhagen. Discussions will also be taking place on the changes needed for Europe to move to an eco-efficient economy and placing eco-efficiency at the heart of European economic recovery. "The Scottish Government has already shown itself to be a world leader on addressing climate change with the introduction of our Climate Change Act and our ambitious but achievable target of cutting emissions by 42 per cent by 2020. "This is an opportunity to demonstrate that leadership to European environment ministers and to inform global discussions as we make the case for Scotland's strong position on climate change." Banff & Buchan MSP Stewart Stevenson has lent his support to the World Wide Fund for Nature's (WWF) campaign for the EU to adopt Scotland's world leading climate change targets at the coming Copenhagen climate change summit. 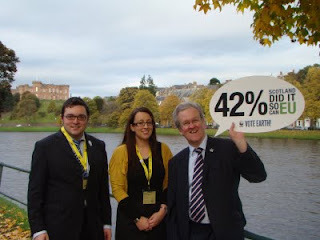 During the SNP conference in Inverness, Mr Stevenson spoke in a debate on the Copenhagen conference before backing the WWF's call for the EU to adopt Scotland's target of a 42% carbon emission reduction by 2020. "I was extremely proud when the Scottish Parliament passed ambitious climate change legislation that puts us at the forefront of worldwide efforts to reduce carbon emissions. Scotland now has tougher targets than any other part of the world. "However, Scotland alone cannot win the fight against climate change and I sincerely hope that other countries in the EU will follow our example and adopt similar carbon emission reduction targets. That is why I am happy to back the WWF's campaign ahead of the Copenhagen Conference. "Copenhagen is a massive opportunity for the world to step up and take action on climate change. The UK Government is currently trying to stop the Scottish Government being part of the delegation, but one way or another the Scottish Government will be there to make our voice heard and tell other countries about the world leading targets we have adopted." The old carriageway of the existing M74 motorway is being recycled in the construction of the new M74 Completion. The M74 Completion project is committed to the reuse and recycling of aggregate material wherever possible. The most recent initiatives have seen the reuse of 65,000 tonnes of material resulting in a CO2 reduction of 118,000 tonnes, equivalent to the daily output of over 113,300 people - nearly twice the combined population of Rutherlgen and Cambulsang through which the route passes. The carriageway of the existing M74 was resurfaced in 2008 at Lesmahagow with material being stored for potential future use in the motorway completion which stretches from Fullarton Road Junction near Carmyle to the M8 west of the Kingston Bridge. Nearly 40,000 tonnes of material has been imported and is currently taking on a temporary role aiding the settlement of one of the embankments at the Farmeloan Road Underbridge in Rutherglen after which it will be used as permanent fill material. The project has also been working in conjunction with NISP Scotland - an industrial symbiosis programme funded by the Scottish Government to facilitate recovery, reuse and reprocessing of materials between companies. NISP identified a source of suitable material from another nearby construction project within 500 yards of the M74 Completion. 25,000 tonnes of clay produced by excavation works at Scottish Enterprise’s Cambuslang Investment Park will be recycled as fill material in the construction of the new motorway providing environmental benefits. "Recycling measures within with the M74 Completion project are a demonstration of the ways in which road building projects can be made more sustainable. "In December last year we laid before Parliament the most ambitious climate change bill anywhere in the world and greener construction methods can help us reach us our emissions reduction target of at least 80 per cent by 2050. "In these challenging economic times we need to pursue every possible opportunity we have to create wealth. The M74 Completion project supports our purpose of sustainable economic growth and it is being built in ways which also respect our environment and natural resources." "By working with a Chief Materials Engineer from the M74 Project, NISP were able to source material from a local excavation project thus reducing carbon emissions from transportation and diverting material from landfill." Over 500,000 tonnes of aggregate will be recycled during the construction of the five mile route, enough, if piled 1m high, to cover the playing surfaces of Hampden, Ibrox and Celtic Park more than 11 times over. Material has been sourced from the Sighthill and Royston areas of Glasgow, demolished flats in the Gorbals and the former Hoover factory in Cambuslang. The practice of using recycled or reclaimed aggregate has significant positive environmental impacts as it mitigates the need to quarry virgin material and can also reduce carbon emissions by making use of sources nearer to the site of construction, minimising transportation requirements. Project contractor Interlink M74 Joint Venture has a comprehensive range of initiatives in place to minimise waste and maximise the ruse of materials; to date 82% of the 2,338 tonnes of waste produced by the project to date has been recycled. In addition, its paper recycling initiative has saved 112 trees from use as paper pulp. "We have adopted a robust and diverse series of environmental objectives for the M74 Completion project which includes waste management and sustainability. For this objective, we have focused on ensuring that our operations beneficially reuse materials where possible and that our waste streams are recovered and recycled where possible. "Through excellent working practices and understanding of the natural and built environments we have been able to use these significant quantities of recycled aggregates in the construction of the new section of motorway. This achievement involves everyone on the project from the client, designers and planners to those at the workface as well as suppliers and subcontractors." The project’s sustainability achievements continue to be recognised within the industry and it has again been awarded full points for environmental performance in its annual review by the Considerate Constructors Scheme, a national programme which monitors companies against a code of best practice beyond statutory requirements. Banff & Buchan MSP Stewart Stevenson has welcomed the news that Grampian Police numbers are set to pass the 1,600 officer mark for the first time in the force’s history. Before May 2007, the SNP promised to increase police numbers on Scotland’s streets by 1,000 officers and earlier this year that target was met ahead of schedule. On Wednesday (21 October) a further 11 officers will be sworn in to Grampian police, taking the force strength to 1,604. “I am delighted that Grampian Police are set to put a record number of officers on the streets of our communities, making Banff & Buchan safer through detecting and deterring crime. “This latest milestone further demonstrates the SNP Government’s continued commitment to protecting communities and fighting crime in Banff & Buchan. There is simply no substitute for putting more bobbies on the beat and ensuring that the police have a more visible presence on our streets when it comes to driving down crime. The Minister for Transport, Infrastructure and Climate Change, Stewart Stevenson, today announced the re-appointment of Duncan Sutherland to the British Waterways Board. Mr Sutherland has worked for Lancashire County Council as Head of Tourism and Leisure Development; English Tourist Board as Head of Implementation; Inner City Enterprises PLC as Director; Coventry City Council as Director of City Development; the EDI Group Ltd, as Chief Executive and is currently Managing Director of Inpartnership Ltd.
Mr Sutherland was first appointed to the British Waterways Board in 2006. This re-appointment will be for 3 years and will run from September 25, 2009 to September 24, 2012. This post is part-time and attracts remuneration of £13,030 per annum, with an additional annual fee of £1,000 payable if appointed to serve on the BW Scotland Group or for the Remuneration, Pensions, Fair Trading, Audit or Property Committees, plus an additional £1,500 for acting as Chair of the BW Scotland Group or one of those Committees. The time commitment is agreed annually with the Chairman of the Board. British Waterways is a cross border public corporation which runs its affairs on a commercial basis consistent with its statutory powers and its objectives agreed by the Government. It promotes the use of its waterways for leisure, recreation, tourism, regeneration and transport while also conserving the waterways' natural and built heritage. Two members of the Board are appointed by Scottish Ministers. This Ministerial public appointment was made in accordance with the Office of the Commissioner for Public Appointments Code of Practice. All appointments are made on merit and political activity plays no part in the selection process. However, in accordance with the original Nolan recommendations, there is a requirement for appointees' political activity (if there is any to be declared) to be made public. Mr Sutherland has not declared any political activity. Banff & Buchan MSP Stewart Stevenson today spoke of his “dismay” at the announcement that the Lloyds TSB Foundation Scotland is to suspend its grant aid to charities for the foreseeable future. Mr Stevenson has written to the Chief Executive of Lloyds TSB Scotland, Susan Rice, to call for urgent talks to establish a way forward. The Foundation, which is completely independent of the bank and has supported numerous charities and voluntary groups in Banff & Buchan, has made the decision as no agreement has been reached with Lloyds Banking Group on how the Trust would operate until the Group returns to profit. The Foundation has, however, indicated that projects to which they have already committed will continue to receive funding. “I am dismayed that the Lloyds TSB Foundation has had to take the step of suspending its grant aid activities. It is a major source of charitable funding in Scotland and has contributed substantial sums of money to good causes in Banff & Buchan over the years. “I understand that the Foundation has not been able to reach an agreement with Lloyds Banking Group over the way in which the Foundation will be funded until the Group itself returns to profit-making status. “The heart of the matter seems to be that, while Lloyds Banking Group has indicated its willingness to continue funding the Foundation, it also proposes to remove the Foundation’s independent status as a condition of continuing support. The Foundation, quite understandably, has refused those terms. “I find it difficult to believe that, at a time when the public reputation of the banking sector is at an all-time low, Lloyds has sought this sort of renegotiation. It certainly doesn’t do anything to improve people’s opinions of bankers. A new era of opportunities for Lerwick Harbour is being launched officially today, Tuesday, 13 October, with a celebration marking the latest significant phase in an ongoing development programme at the Shetland port. A £12 million dredging project in 2008 opened the door to improved access for larger ships now operating in various sectors, including offshore oil and gas, fishing and the cruise industry, and reclaimed land for new developments. To commemorate the occasion, Stewart Stevenson MSP, Minister for Transport, Infrastructure & Climate Change will unveil a framed edition of the port’s navigation chart, updated following the project. “This is an exciting project and the improved access will provide a real boost to Shetland’s local economy, encouraging larger vessels to call in to these islands. In these challenging economic times, it’s important that our more remote communities play to their strengths and this £12 million investment does just that. The Minister and other guests will see the areas of improvement while touring the port on board the ferry, Hjaltland. There is now a minimum of nine metres of water depth north to south through the entire harbour, which has two entrances. The dredging provided a deepened north channel and a widened north entrance and basin at Greenhead Base. Benefits for the pelagic fish sector include deepened berths at Shetland Catch and at Shetland Fish Products’ fishmeal and oil factory at Heogan, Bressay. Dredging was also carried out for a new quay, now being planned as the site for Lerwick’s new fish market for white fish landings. The project has also enhanced Lerwick’s role in the offshore industry, including in handling larger vessels, onshore decommissioning, and marine support for offshore exploration, development, production and decommissioning. Construction of two news quays, with nine metres’ water depth, at Greenhead Base will begin next year, increasing the berthing by a third. Concepts have been developed to show how Lerwick can provide deep-water infrastructure with at least 20 metres’ depth. There are two suitable locations, at Dales Voe and next to the reclaimed land at North Greenhead. Designated for future development, the reclaimed area, extending to more than 10 acres, has been created from the dredged materials sourced in the largest single capital scheme in the port’s modern history. The UK and Scottish Governments have reported back on a consultation into a scheme to reduce carbon emissions. Two key changes have been proposed by the UK and Scottish Governments in how a new carbon reduction scheme to reduce emissions from businesses and organisations will be implemented across the country. The Carbon Reduction commitment is the UK's first mandatory domestic emissions trading scheme, and will involve organisations such as supermarket chains, hotel chains, office-based corporations, government departments and large local authorities. The CRC Energy Efficiency Scheme will deliver emissions reductions cost-effectively by driving energy efficiency, saving participants money and enabling sustainable growth. The response sets out changes being made in the light of views received from stakeholders. Large organisations can now choose to split themselves into smaller groups to participate in the scheme independently. “This new commitment will encourage businesses and organisations to think about the energy they consume and make important decisions about how they operate. “From 2010, we will be looking to reduce emissions on an annual basis as we work towards reaching the target of 42 per cent reductions in emissions as laid out in the Scottish Government’s world-leading Climate Change Act. We will outline the plans and proposals that we will adopt to set us on a trajectory towards a low-carbon future. This is part of that commitment." The final element of the multi-million pound integrated transport hub at Laurencekirk has been completed. The £450,000 car park at the new Laurencekirk Station is being officially opened on Wednesday (October 7) by Aberdeenshire Provost Councillor William Howatson and Councillor Kevin Stewart, chair of the regional transport partnership Nestrans. The car park provides 70 spaces, including spaces reserved for drivers with a disability, and is linked by a fully accessible footbridge to the station. It caters for the high passenger levels at the station that to date has seen demand exceed pre-opening forecasts by 80%. Over 22,000 journeys have been made to and from Laurencekirk since the station opened in May and current projections are that 65,000 passengers are set to use the station in its first year of operation. Nestrans has funded the £450,000 car park, which was designed and supervised by Aberdeenshire Council with the works implemented by north east firm MTM Construction. It includes full CCTV coverage that links to the ScotRail Customer Service Centre. With 10 services a day in each direction from the station, the opening of the car park broadens the choice for passengers as to how they get there - walking, park and ride, passenger drop-off (or ‘kiss and ride’), or using the local Demand Responsive Transport service are all already options for communities across the area. “The opening of the car park at Laurencekirk will undoubtedly deliver real benefits for passengers. “Laurencekirk has been a tremendous success since it opening earlier this year as part of the Scottish Government’s extensive rail investment programme. We believe the new car park will make it even easier for people to make the switch to a more sustainable mode of transport. "It’s great to the see the final part of this key project in place. It’s the latest in a series of key moves to create better local rail services for the people of the north-east and we expect to see further projects come to fruition in the coming years. "We actively promoted and funded this project because it broadens transport choices for people in the local area and makes for a more efficient transport network all round." The Grade B listed Laurencekirk Station re-opened in May this year after being transformed through a £3.5 million investment, with Scottish Government funding provided by Transport Scotland and Nestrans, supported by Aberdeenshire Council and a Railway Heritage Trust grant. Banff & Buchan MSP Stewart Stevenson is urging high-risk groups of society to take up the free seasonal flu jabs offered on the NHS, and ensure they are protected for a year. This week marks this start of the Scottish Government’s annual flu immunisation campaign running over the winter months, but the SNP MSP is greatly concerned that many people are unaware that they are eligible for a free jab. A separate vaccination campaign will begin in the next few weeks to vaccinate people against the H1N1 pandemic flu virus. “It’s a common misconception that only older people are eligible. In actual fact, many others are considered ‘at risk’ – including healthcare workers and people with certain conditions. If these people do not get vaccinated, they are leaving themselves vulnerable to the effects of the virus. “Although a lot of attention has understandably been focused on the dangers of the H1N1 pandemic, it is important that vulnerable people protect themselves against the danger posed by seasonal flu too. “There are separate vaccination programmes for seasonal flu and H1N1, but those who are eligible for both should make sure that they get both jabs and make sure that they are protected”. 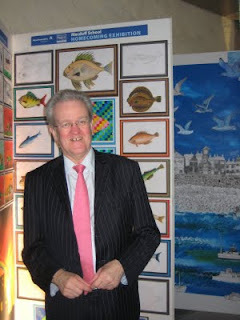 Banff & Buchan MSP Stewart Stevenson has praised the quality and variety of artwork created by school pupils in all of Aberdeenshire’s schools after a large selection was brought to the Scottish Parliament for display. Children were asked to create a piece of art that had been inspired by the ideas behind Homecoming and pupils’ local areas and have been displayed in locations across Aberdeenshire. Those pieces of art that are not currently on display in the Scottish Parliament are shown on tv screens accompanying the exhibition. “I know that I and everyone else that has seen the art on display has been extremely impressed by both the quality of what has been produced and the sheer variety of ways in which the idea of Homecoming has been interpreted. “I am sure that pupils across Aberdeenshire, not to mention their parents, will be extremely proud that their artwork has gone on display in so many locations and has now been brought to the Scottish Parliament for people here to enjoy. “What is striking is that whether it is fishing vessels returning to their home port with their catch or local wildlife that also call the area home, they clearly show an idea of Homecoming that uniquely reflects life in Macduff. “I was delighted to be able to host a reception as part of their visit and have been extremely impressed by what the project has produced”. A new early morning service between Neilston and Glasgow will be introduced as part of the new winter timetable announced by Transport Scotland. The new timetable introduces additional services from Sunday 13 December, bringing benefits to thousands of passengers across Scotland. Operated by ScotRail, the new Monday-Saturday service will allow commuters to travel from Neilston and arrive at Glasgow Central before 0700, allowing earlier connections to Edinburgh and the wider rail network. Currently, the first service from Neilston departs at 0656 with an arrival at Glasgow Central at 0724. From December, the first service departs Neilston at 0630 and arrives in Glasgow at 0659. Other services introduced as part of the winter timetable change include a new hourly fast service between Glasgow Central and Edinburgh via Shotts, a new half hourly service between Glasgow and Kilmarnock, earlier morning services from Ayr and Gourock to Glasgow and the introduction of an early morning Dumfries to Glasgow and late evening Glasgow to Dumfries services. "These new services demonstrate we are committed to investing in Scotland’s public transport infrastructure and creating the infrastructure necessary to promote sustainable economic growth. "We are working hard to ensure communities across Scotland can benefit from access to the rail network and are investing significantly in extending services – both in terms of expanding infrastructure and plugging gaps in the timetable. "We have attempted to strike the correct balance between enhancing connectivity and improving journey times and we believe these changes being introduced in December will mean even more people will have the opportunity to make the switch to public transport." "I welcome these widespread enhancements, with the number of services increased and also changes to improve connections. "These improvements will bring many benefits to our growing number of customers." The Minister for Transport, Infrastructure and Climate Change Stewart Stevenson today announced the appointment of nine new Members to the Mobility and Access Committee Scotland (MACS). Bob Benson is currently a member of the Equality and Human Rights Commission's, statutory Scotland Committee and as such also co-opted onto its statutory Disability Committee. He has considerable experience in the equality and human rights field and is a trustee of the Scottish Community Foundation and Chair of its Grants Committee. He was previously an Executive Director for Community Development with Scope, and Director Scotland, Disability Rights Commission. Clare Byrne has been a director of Spinal Injuries Scotland since 2004, a position which does not attract remuneration. She has a background in retail management, specializing in training. Heather Fisken currently works as Project Manager for the Independent Living in Scotland Project at the Equality Human Rights Commission. She was previously employed in a variety of roles in the Disability Rights Commission including in policy, practice development and introducing the Disability Equality Duty to Scotland. She was previously a Trustee of the RNID and has worked as an Inclusive Design Consultant. She is a graduate of the Inclusive Environmental Access and Design course at Herriot Watt University. Jane Horsburgh is Public Policy Manager for Guide Dogs for the Blind Association. She was previously a board member of MACS from 2005 to 2008, and was involved on the Departments for Transport's Research on Designing for Disabled People in Home Zones. She is a member of the Scottish Accessible Transport Alliance, and a previous member of Angus Access Panel. Grahame Lawson was Head of Planning, Roads and Building Control for North Lanarkshire Council until he retired in 2004. He was an adviser on disability matters to the Convention of Scottish Local Authorities and for many years he was a member of DPTAC where he chaired the Personal Mobility and Local Authority Working Group and led on Blue Badge issues. He is a Fellow of the Institution of Highways and Transportation. Muriel Masson is a trustee of SKILL, member of SKILL Scotland branch committee and sits on SKILL Council. She has also been the convener of Edinburgh University Disabled Students Group for several years. These posts do not attract remuneration. She is currently finishing a PhD in Osteoarchaeology. Annette Monaghan currently works in the Human Resources Directorate of NHS Greater Glasgow & Clyde. Her background is Learning & Education and Organisation Development. She is on the Board of Impact Arts, an arts charity based in the east end of Glasgow but with projects throughout the central belt. This position does not attract any remuneration. Jane Steven was a qualified nurse and social worker with a long history of working on both disabled issues and rural community and access issues and on Collaborative and Community Development Projects until her retiral. She has been an Individual Public Member of Network Rail for 3 years and is a member of Passengers Views Scotland and of the management committee of Carers of East Lothian. Shonagh Terry works as an HR Consultant, latterly in interim or short-term HR Management roles, mainly in Strategy, Policy and Employee Relations. She has experience of working within Local Government, Non-Departmental Public Funded Bodies, Government Research Councils, Multi-Nationals and the Finance Sector. Her initial career was as a self employed Chiropodist. These appointments will be for 3 years and will run from October 1, 2009 to September 30, 2012. The posts are part-time and attract remuneration of £100 per day for a time commitment of up to one day per month. Jane Steven is currently a Member of Passengers' View Scotland and receives a daily attendance rate of £100 per day for a time commitment of up to one day per month. None of the other newly appointed members currently hold appointments with other Public Bodies. These Ministerial public appointments were made in accordance with the Commissioner for Public Appointments in Scotland's Code of Practice. All appointments are made on merit and political activity plays no part in the selection process. However, in accordance with the original Nolan recommendations, there is a requirement for appointees' political activity within the last 5 years (if there is any to be declared) to be made public. Muriel Masson has stated she is a member of the Scottish Socialist Party and attends local branch meetings whenever possible but does not hold any office or paid position. She was president of Edinburgh University Scottish Socialist Party Society in 2004-2005.